How to plan perfect vacation? It is a queer feeling when you stand somewhere knowing for sure that many great Kings had once stood in the same place, seeing the same things as you do, and feeling the same owe. When I went to Mahabalipuram last year, I was mesmerized by this feeling as I walked through the magnificent sculptures of the Pallava age. Mahabalipuram is an ancient town and seaport in the Coromandel Coast, locate at 56km from Chennai. Mahabalipuram is also known as Mamallapuram after the great Pallava King Narasimhavarman Mamalla I. In some ancient scriptures, Mahabalipuram is also referred as the “Kadal-Mallai Thalasayanam” which roughly translates to the city that lies near the ocean and the hills. From the days I first heard about Mahabalipuram and its immense archaeological and historical charm, I always wanted to visit it sometime. My wish came true in a hot, sultry May afternoon in 2014. In the ancient times, the Europeans who passed through this Coast called Mahabalipuram “The Land of Seven Pagodas”. Apparently Mahabalipuram was a magnificent city with seven temples on its eastern sea shore and the myth says that the ocean engulfed it in ancient times. However there is one temple or Pagoda still standing in the shore of Mahabalipuram and it is known as the “Shore temple”. During my travels, I am always curious about the stories that hang around the destination. Mahabalipuram is a treasury of myths and folklore. It all starts with Hiranyaksha, the Asura(Demon) who abducted the Bhumi Devi(Goddess Earth) deep into the oceans. Vishnu took the form of a boar (Varaha) to rescue her and killed Hiranyaksha in the fight. Hiranyakashipu was the elder brother of Hiranyaksha and he refused to adore Vishnu. Prahalada was the son of Hiranyakashipu. Due to the influence of Shukracharya – the sage and guru, Prahalada became a Vishnu devotee. Hiranyakashipu was enraged and ordered to kill Prahalada; however he couldn’t due to the divine intervention. Hiranyakashipu changed his mind after some time and invited Prahalada back into his court. However, Hiranyakashipu challenged Prahalada to prove Vishnu is omnipresent. He stroked down a huge pillar as a challenge to the omnipresent God. Vishnu emerged out of the pillar in his Narasimha Avatar and killed Hiranyakashipu and installed Prahalada in the throne. Son of Prahalada was known as Virochana and he had a son named “Bali”. “Bali”- the grandson of Prahalada - founded the magnificent city of Mahabalipuram. There is also a folklore about an eminent prince of Mahabalipuram, known as Mallicheren, who was in a thick friendship with a Gandharva(nymph) from heavens and Mallicheren stealthy visited heaven once. Awed by the beauty of the heaven, Mallicheren came back to Mahabalipuram and replicated the heavenly splendor in the architecture of Mahabalipuram. The Lord Indra grew furious and jealous, he appointed “Varuna” the God of ocean to engulf Mahabalipuram. The angry ocean attacked Mahabalipuram and the city with swish palaces and elegant seven pagodas was gone in moment. The old people in Mahabalipuram still remember their grandparents mentioning about seeing the tip of the seven pagodas far away in the sea with their gold plated Shikhara(tower) glittering in morning sun. 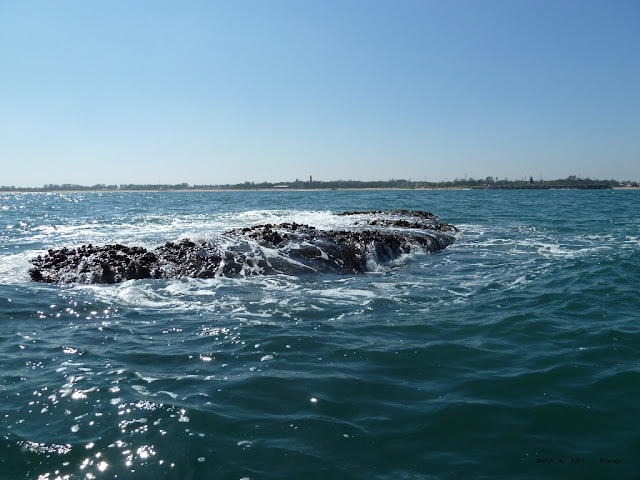 This may be just an urban legend; however during 2004 Tsunami in the Bengal Ocean, Mahabalipuram beach pulled back around 500meters and tourists witnessed a large row of rocks emerging out of the water! It might be the remains of the seven pagodas. As the coast line changed after Tsunami, it unearthed few sculptures which were previously submerged in water. 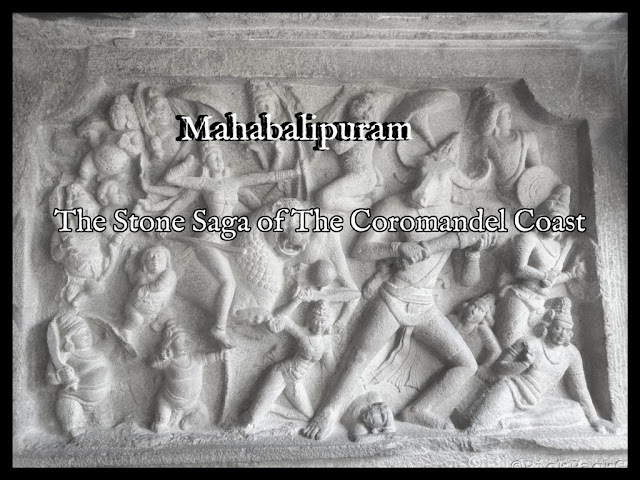 The history of Mahabalipuram from 6th century AD is very well documented. Majority of the sculptures and temples in Mahabalipuram is attributed to the great Pallava dynasty starting with Simhavishnu. 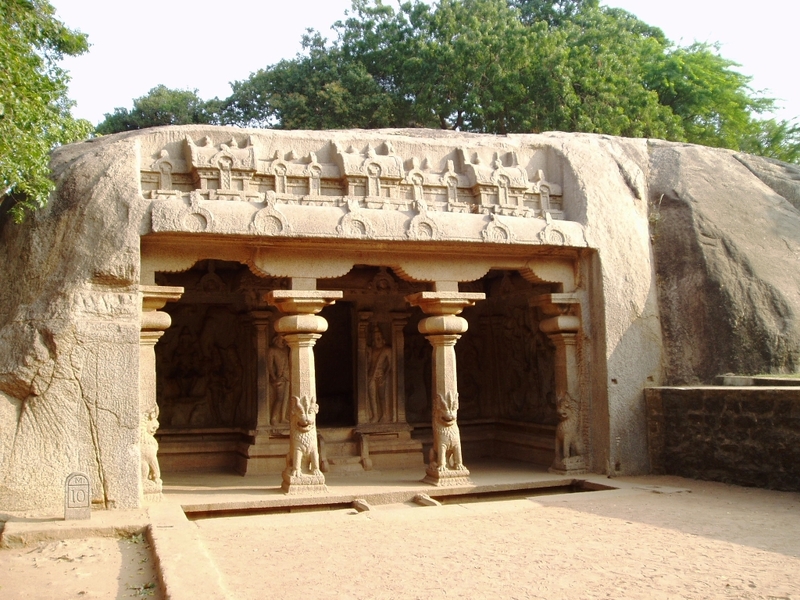 From 550AD, Pallavas created the cave temples (Mantapas), Monolithic temples (Rathas) and structural temples (like Shore temple) in Mahabalipuram. There are around 8 cave temples in different parts of the Mahabalipuram town; however it takes almost a day to visit all of these. Most of the tourists only visit two or three as they don’t know the existence of the rest. We also did not get the chance to visit all the caves, but I have gathered information about all of them so that someone with keen interest doesn’t miss them. As we entered into the Mahabalipuram town, the first land mark is a huge bas relief on the side of a 30 feet tall rock. This marvelous creation is known as the Arjuna’s Penance. to a cave temple standing just opposite to the road side. It is known as the “Krishna Mandapa”. We walked past through the pillared portico of Krishna cave temple which dates back to 650 AD. There are two rows of pillars. The first row is very ornate with seated Vyaalis(Dragons) at the bottom and the second row is less ornate compared to the first. As we entered the cave we saw a sculpture of Krishna lifting the Govardhana hill to protect cows and his kin from the heavy rain. There are casual scenes also, like a cow is being milked while it is licking its calf. 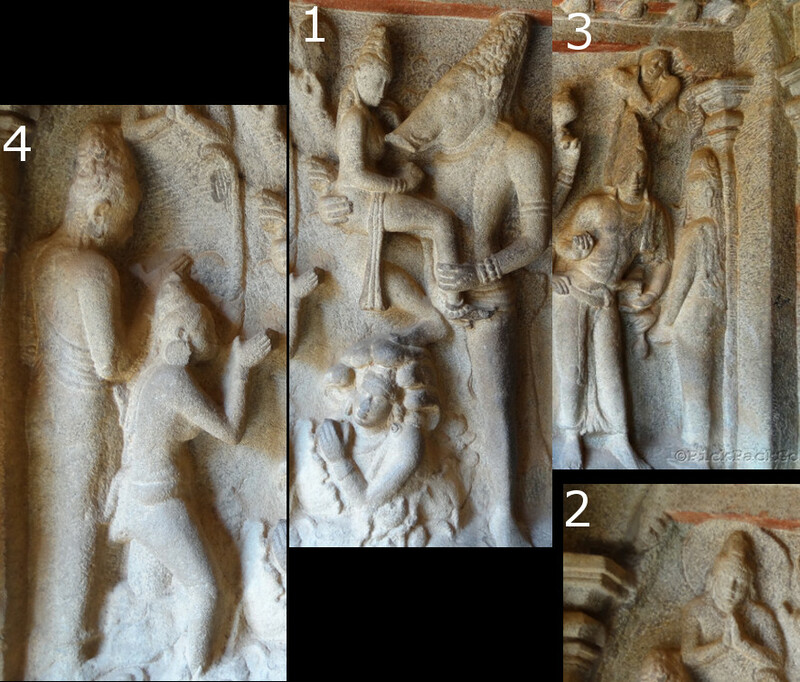 These scenes from the everyday life marvelously integrated into the of the mythological themes makes the sculptures of Mahabalipuram humane and divine at the same time. There is another cave temple known as the "Varaha Mandapa" located very near to the the Krishna cave temple. Our next destination was this cave temple. As we entered into the “Varaha Mandapa” there was a visual treat right near the entrance of the temple. It was the panel depicting the rescue of Bhu-Devi by Vishnu in his Varaha Avatar. The varaha panel features the four armed Vishnu lifting Bhu-devi from the abyss. In the rear hands he carries a Shankha and Chakra. On the opposite side of the wall, we found the Tri-Vikrma Panel. This panel shows Vishnu in Vamana Avatar. This panel features the story of Vishnu in the modest Vamana Avatar demanding the Asura King Bali to grant him three foot of land to do his prayers. The generous Bali immediately agreed. Suddenly Vamana converted himself into the huge form of Trivikrama measuring the earth and heavens by two steps. He asked Bali, for the third step that he was promised. The Trivikram panel depicts this moment. Eventually, as per the legends, Bali offers his own head to Vishnu, thus keeping his promise and sacrificing himself. The body of Tri-Vikrama is dividing the whole panel into three regions. till the knee of Trivikrama is Bhu-loka(Earth), above it up to naval is Antariksha-loka(Sky), and above it up to forehead is Swarga-loka(Heaven). So we can see Bali and Sukracharyar was on the knee level, the sun and moon are on the waist level and Brahma and Shiva is above forehead denoting the Swarga loka. We walked around to see the other panels in this temple which includes the Gajalakshmi panel and the Durga Panel. A seated Gajalakshmi, holding lotuses in both the hands is assisted by maidens carrying water vessels. Two elephants are shown, one pouring water over Gajalakshmi and other is taking the vessel from the maiden. Next to this panel is a bas relief of Durga with four arms. Durga is standing with with her Vahanas (Vehicles) and Gupta Ganas(Army) and devotees. One of the devotee is offering his head(that is horrifying! ) and other showing vismaya. We spent an ample time within the Varaha cave and as we moved towards the rocky mountain side of Mahabalipuram, we saw a stunning piece of rock. This rock, which looks like some one has scooped it out of a hill, is known as the "Krishna's Butter Ball". It is believed that this rock was there for at least 1000 years . During the olden times, the European rulers of India tried to move this rock with the help of elephants but they couldn't! As I looked at the people relaxing under this massive rock, least bothered about the chance of the rock rolling down, I couldn't help but wonder that - "It is all about faith!" 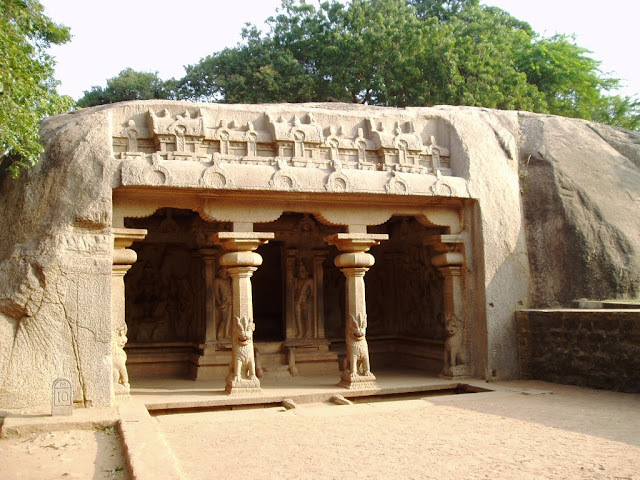 Off the “Mada Koil Street” near the Mahabalipuram lighthouse, the Mahishasura Mardini cave temple is located. We had to walk past the light house to locate this cave temple. A good tour guide can route you very well. The central sanctum of this temple has Siva and Uma with toddler Skandha in between them they are seated relaxed, placing their feet on Nandi. As I climbed the steps leading to the pillared portico (Mandapam) of the Mahishasura Mardini cave, I couldn’t control my excitement to see that one structure known as the “Masterpiece of Indian bas relief” - war between Goddess Durga and Mahishasura. It is a dynamic scene from the battle between the elegant and slender Durga and the stout and powerful Mahishasura . The characters in this panel are perfectly positioned in time and space. Durga about to strike an arrow at Mahishasura, the Asura in a quite frightened and awed posture trying to hit one last time. It also portrays the vigorous army of Durga and the disheartened army of Mahishasura. The emotion of not only the main characters, but on every living being in this panel is perfectly captured. I spend some time looking around the panel wishing if the world knew the genius (es) who created this master piece. Unfortunately only the Kings are always remembered and the artisans are nameless. I usually control the urge to touch and feel the archaeological pieces as it would tamper them. but I couldn't control myself here and I touched this panel for quite a long time trying to connect with that unnamed genius who created it. Another bas-relief that is no lesser marvel than the above one is the “Vishnu Anantha Shayi in yoga nidra “ ”(The God Vishnu in meditative sleep on his five hooded serpent “Sesha Naga or Anantha”). The figures around Vishnu are also note worthy. Bhu-devi is praying on the right side of the Vishnu (1) and Asuras Madhu and Kaidhaba are prepared to do the evil (Legend here) and standing at the right most corner of the panel(3). Ayudha purusha are at the lower level(2) (Vishnu weapons in the human form are known as Ayudha purusha). Surya and Chandra are on the either top sides of the panel. Nice to see a blog post by you again.